Today’s world is full of technology helping us do things faster and better. Corporate meetings that used to eat up a chunk of our day (because coworkers are late, sick, or out of town) can easily be handled with live conferencing. People can enter and exit the meeting quickly and be more efficient in their jobs because they are saving the company both time and money. Nothing, however, is perfect or fool-proof. 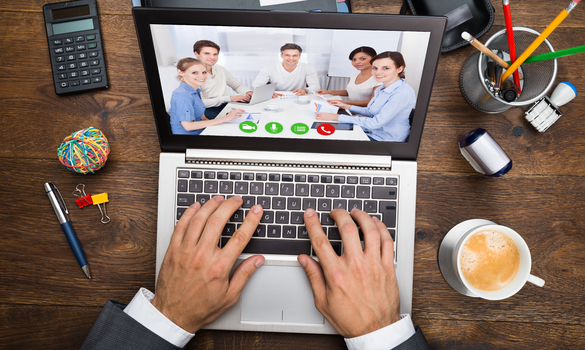 Read on to see how you can best set yourself up for successful and efficient video conferencing. Know your video conferencing software. This will undoubtedly save time and headaches during your meeting in case someone needs to call in using virtual phone numbers. Set up and bring as many visuals as you can to make your presentation more appealing to those on the other end of the camera. Using white boards, charts/graphs (all with good lighting) will engage your participants and make your meeting run smoother. Get to the meeting early to check everything is working properly, however sometimes it is out of your control. Continue on to the next step to see what you can do to remedy things that are simply out of your hands. Yes, this is the good ol’ Boy Scout motto, but it’s a serious life skill that we all need. Sometimes we get too comfortable with things we do all the time. Even if an employee’s job is to set up live video conferences on a weekly basis, that’s not to say something could prevent it from happening. Hence, have a backup plan. It could be a rainy/windy day and your connection might simply fizzle, so rather than postponing your business conference you can prepare ahead of time and not miss a beat. Something as simple as setting up a phone (with a speaker) on the conference room table will be your go-to in case of any issues with the video. Even though you might not be the team member in the office, you should still act as if you are. Being on video vs. a phone call means that you should not only be dressed appropriately, but make sure you in are an area that doesn’t distract you and your coworkers from hearing each other (and wasting time because of noise). If you are in a coffee shop, it will most likely be bustling with patrons as well as the din of the espresso machines and coffee grinders. Working from home (whether it’s by choice or necessity) always has its perks, however crying children and/or barking dogs can lead to delays during your meeting. Plan ahead to make sure you have a quiet, comfortable place to join the meeting and it will save everyone time (and maybe a headache). Non-verbal communication is sometimes just as important as what you are saying. If you are managing a virtual business, it can be tough to meet in person. Phone calls can only convey the messages you are speaking, but not what you are holding back. Body language in face-to-face meetings says a lot to the other people in the room, and video conferencing can now incorporate that. If a participant is lost, unsure or confused, an awkward silence on the phone doesn’t necessarily communicate their issue…facial expressions will let others know that there might be something else to address. When team members cannot be in the same room (looking at each other), video conferencing is the next best solution to get things done quickly. Having a moderator for the virtual conference meeting is a good idea. This individual can set up the time/date of the meeting, invite the participants, set the agenda and give an estimated length of the meeting so everyone can plan accordingly. During the video conference, he or she can determine if more time is needed or if the meeting needs to be continued on another date due to time constraints. Nobody likes to waste time, nor do they want to exit a long meeting feeling as if their team didn’t accomplish the goals they laid out for themselves. As you can see (and probably already know), technology can be both a blessing and a curse. It can help us do things that years ago didn’t seem possible, while frustrating us along the way. Video Conferencing saves companies so much time and money because they don’t have to shuttle employees between cities, but if the preparation isn’t there for the meeting it doesn’t really matter anyway. If video conferences are treated as though everyone were in the same room, most of the items addressed in this article would be null and void. However, we tend to rely on technology to do things for us that it simply cannot do (ie: mute out noises, fix technical errors). Conferencing technology will only get betters as the years go on, and we will also adapt to using the software and being a part of it, as well, and meeting will become more and more efficient.